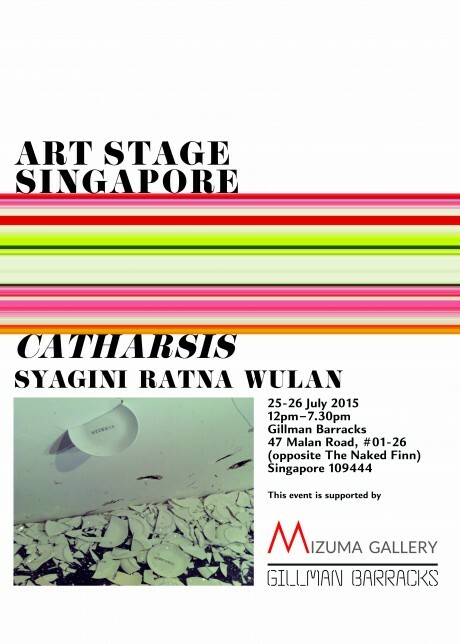 From 25 to 26 July 2015, Art Stage Singapore proudly presents a participatory performance art piece, Catharsis, by Indonesian artist Syagini Ratna Wulan, in support of Gillman Barracks. Taking place in an empty gallery space, artist Syagini Ratna Wulan has created a written diagram of texts ranging from ‘belief’ to ‘institution’ on the wall. Visitors are provided plates and invited to write a word on them before throwing the plates against the wall, taking aim at a word that resonates with them. Through this act of release, Catharsis aims to incite a sense of purification and cleansing of oneself.Syagini will also be present to share and discuss her artistic concept and motivations behindCatharsis. Join us as we chat with the artist on 25th and 26th July from 1.00pm to 1.30pm. This event is supported by Mizuma Gallery and Gillman Barracks, and is part of Gillman Barracks’ Art Day Out! Admission is free. Gillman Barracks will provide shuttle bus services from HarbourFront MRT (exit D), Queenstown MRT (exit B) and the bus stop in front of PSA Building throughout the duration of Art Day Out!.